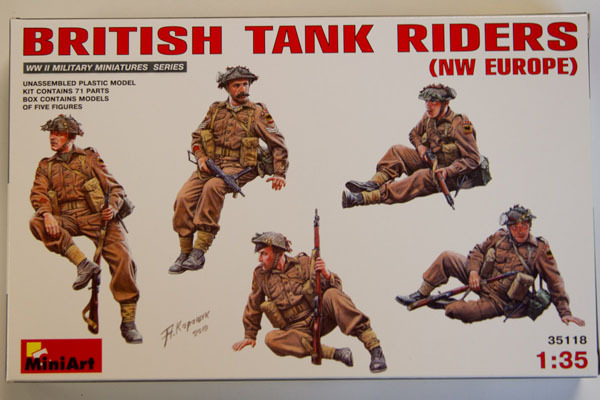 Can an armor modeler ever have too many "tank riders" to sit on the rear of their tank models? Certainly not, and especially with a set as well produced as this one by MiniArt Models of the Ukraine, who over the past few years have created a great reputation for producing innovatively designed WW2 figure sets for the armor modeler. Set 35118 under review today consists of five figures in various "relaxed" resting poses. And while the box top states they are "tank riders", these figures could easily be placed on other vehicles, or even sitting on the ground, or on crates etc. awaiting orders to "move out". Each of the five figures is broken down in a standard way: two individual legs up to the lower waist, then a main torso part up to the uniform collar, with two separate arms, and a separate head. All the heads are missing the top hair section, and so the modeler is forced if utilizing the figures "from the box" to have each wearing the included standard Tommie tin helmet. No bare heads with this set, unless the modeler wishes to add his own upper head of hair. Each figure's head has its own unique expression on the face, and despite the more youthful appearances on the box top, to me the plastic parts have an "older soldier" look to them. One in fact has a moustache, something you don't often see on injection molded figures, but which were fairly common on soldiers, especially NCO's of the time period. The detail on the figures' uniforms is also quite nicely reproduced, with lots of folds in the appropriate places. Separate packs and canteens are provided for each figure, along with the aforementioned Tommy tin helmet. Despite the depictions of these figures on the box top painting, and the rear box painting and assembly "instructions", which show all the helmets with camouflage webbing, the helmets are in fact devoid of any such webbing. Four figures come with .303 Lee Enfield rifles, while the fifth, the mustachioed Sergeant, is armed with a Sten gun. The painting instructions show each soldier with various shoulder patches, and rank insignia, and it would have been nice of MiniArt to include these in the form of waterslide decals. I am sure such items are available in the aftermarket, but having them included with the kit would have been better I feel. The figure parts do have mold lines running down them, as you would expect from an injection molded figure set. However, these lines are faint, and should be easily removed by scraping with a sharp hobby knife blade. The pouches also have the tiniest traces of flash, but again, should be easily removed with a little TLC and a knife blade. 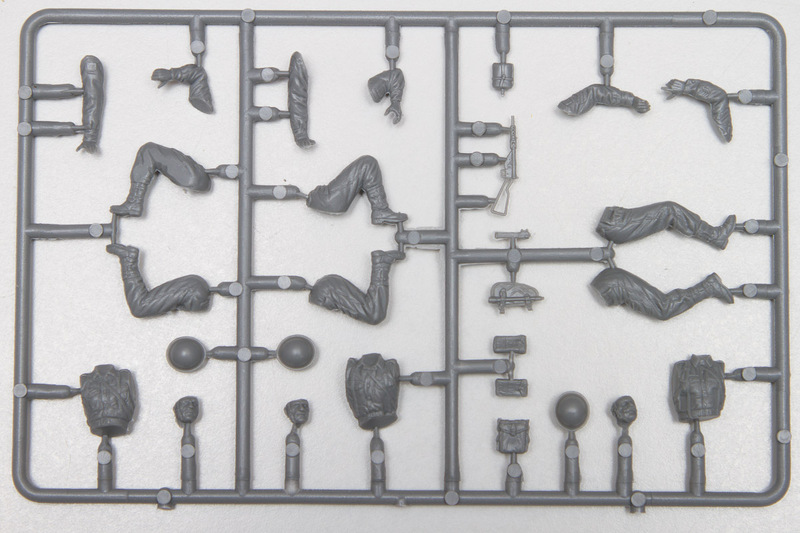 Overall then, this set has a great deal of potential for the modeler who likes to festoon his vehicles with figures, or for the diorama builder who wants to have a bunch of Tommies "sitting about at rest". The poses of the figures appear to be very lifelike in their "sit", and thus come highly recommended. My thanks to MRC for providing Internet Modeler with the review sample.